Add a little color and festivity to your breakfast for Valentine's Day with this quick Valentine's Day parfait. Since no one has time in the mornings, I am all about easy breakfasts that can be eaten on the go. This parfait fits that bill all while being cute and healthy, too. All you need to do is pick up your favorite granola, vanilla bean yogurt (or another flavor...your choice), and strawberries. Next scoop each item into a small glass (or mason jar for easy travel), layering each as you go. I like a tiny layer of yogurt on the bottom then strawberries and granola before piling it on. 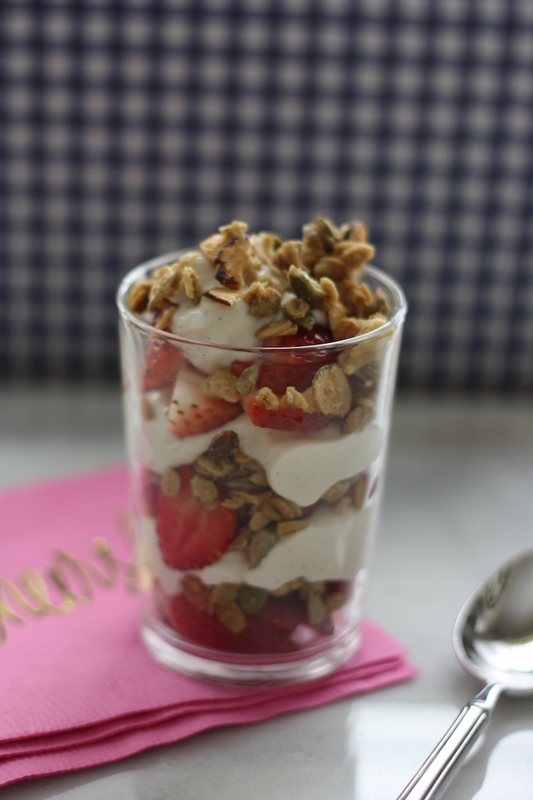 This breakfast parfait turns out super cute and adds a little fun to your morning routine!